Gorgeous shading on your card, Tracey! It's so cheerful! So gorgeous! LOVING the colors!!!! LOVE these colors and your design, Tracey! Oh I should use my distress inks and stencils more... got side tracked with stencils and embossing paste...I like the water sprinkles. Gorgeous, Tracey! These are some of my fave distress ink colors! Very nice, Tracey... flicks? Mine are more like sneezes actually... never a good thing.. I really do "need" to add W&W to my stash! I LOVE this card, Tracey--wonderful combination of colors & that sentiment is perfect! This is awesome, Tracey! Love it! Haha you are funny! I do love your gorgeous bright and beautiful card, and the colors you mixed! Yep the colors are pretty together, this is fun Tracey! Love this bold, geometric design. I love Distress inks too. I wish I could flick water as artfully as Tim Holtz! Oh Tracey this is fabulous! And yes, I just love watching those water drops do their thing!! haha! Love the colors and the tsunami effect! Seriously great card! So, so pretty! Really love that gradient effect, and the triangles are top notch! Love! Just beautiful. Love the sponged look--you are brave to flick water like that! I'd be too scared, but I really like how it turned out. So very pretty Tracey! Love the inky background! This is why I like you. You take something that could be so clean and pristine and give it just that tiny hint of imperfect grunginess. Keep it up because it's gorgeous! I love all the color on this! 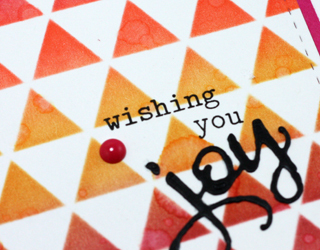 Love the triangle pattern and how you blended your inks with all those pretty colors! Great idea to add the flicks of water, too...it's perfect! Stunning card and after seeing this beauty you have finally sold me on stencils. So beautiful and dramatic too. I need to go shopping now! oh man...those colorful triangles...they just slay me! What a fabulous color combination! Love the blending...definitely have to try this. Oh my...you tsunami-flick comment has me giggling out loud (getting the *look* from my husband). You're hilarious! I wouldn't have even noticed this, so in my books, this is flicker fantastic, triangle terrific, and sponging splendid! Joy achieved!